The U.S. military said Saturday it killed 18 gunmen believed loyal to radical cleric Muqtada al-Sadr in Baghdad, and jet fighters bombarded militia positions on the capital's outskirts. 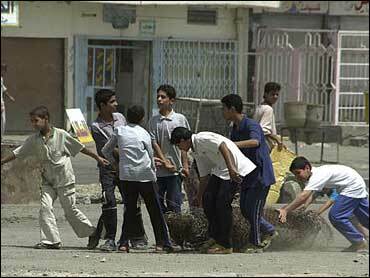 Skirmishes persisted in the southern holy cities of Najaf and Karbala. The U.S. military also reported the deaths of five soldiers, including three killed by rebel attacks. In northern Iraq, rebels fired a mortar round at an Iraqi army recruiting center, killing four volunteers, hospital officials said. The coalition announced a reorganization of its military command structure Saturday, creating a new headquarters with broad responsibility for operations in Iraq, including the training of Iraqi security forces and involvement in the political transition, and another headquarters that will handle daily tactical operations against the insurgency. Lt. Gen. Ricardo Sanchez, a three-star general who was in charge of the previous, unified command, will oversee all operations from the Multinational Forces Iraq headquarters, Kimmitt said. Lt. Gen. Thomas Metz, a three-star general who commands the U.S. Army's 3rd Corps, will direct daily military operations from a headquarters called Multinational Corps Iraq. President Bush insisted in his weekly radio address Saturday that those who beheaded American civilian Nicholas Berg must be hunted down as part of a strategy ultimately designed to bring peace to Iraq. Of the prisoner abuse scandal, the president said, "My administration and our military are determined that such abuses never happen again. All Americans know that the actions of a few do not reflect the true character of the United States armed forces." In the Democrats' weekly radio address, presidential candidate and Mass. Sen. John Kerry said the United States "has a duty to guarantee that, when mistakes are made, those responsible are held accountable whether they are at the bottom of the chain of command or at the top." He added that Washington "has a duty to lead alliances so that the country and its troops will not have to bear "almost alone the burdens of defending freedom." The major Baghdad newspaper Azzaman urged Defense Secretary Donald Rumsfeld on Saturday to resign, joining the international outcry for him to step down over the Abu Ghraib prisoner abuse scandal. The head of the Arab League on Saturday accused the U.S. of sidelining Arab countries in Iraq's reconstruction efforts and questioned the U.N's upcoming role will be genuine or a "cover for occupation." Though dozens of U.S. corporations have government contracts to help rebuild Iraq, "relatively few American companies have invested their own capital," The Washington Post reports in its Saturday editions. The newspaper says unstable security and political situations have kept many potential investors away. U.S. troops are trying to disband al-Sadr's army and sideline its radical leadership before handing power to a new Iraqi government June 30. Al-Sadr is a fierce opponent of the U.S.-led occupation who launched an uprising last month and faces an arrest warrant in the death of a rival moderate cleric last year. In Najaf, militiamen fired a rocket-propelled grenade at a U.S. tank stationed at the city's Police Directorate. The rocket missed its target, and the two sides exchanged gunfire. Elsewhere, a shell landed on a house, wounding a woman. The normally bustling area around Karbala's Imam Hussein shrine, one of the holiest centers for Shiite Muslims, was silent except for intermittent blasts and machine-gun fire. After one blast, a huge column of black smoke wafted over the golden-domed shrine. One Polish soldier was wounded in Saturday's skirmishes, the Polish military said in Warsaw. The confrontations in the two holy cities in Iraq's southern Shiite heartland were less intense than in previous days. In Baghdad, coalition forces killed 18 fighters, many of them in the eastern Sadr City neighborhood, a stronghold of al-Sadr, in a dozen separate engagements Friday and Saturday, the military said in a statement. Troops also killed seven gunmen who attacked them in western Baghdad on Saturday morning, said Brig. Gen. Mark Kimmitt, the chief military spokesman in Iraq. Guerrillas fired a mortar round at an Iraqi army recruiting center in the northern city of Mosul, killing four people and wounding 19, hospital officials said. The shell landed in a crowd of people waiting to sign up for the military. Kimmitt said the projectile was a mortar shell or a rocket-propelled grenade. Insurgents have previously targeted police and army recruitment centers in an effort to undermine Iraqi involvement in the U.S.-led coalition. Hussein Assem, a 25-year-old army volunteer, suffered shrapnel wounds in a hand and leg and was taken to a hospital. "While I was at the entrance of the volunteer center, a mortar shell fell near me," he said. "I fell down together with the others on the floor. I felt I was in coma and I woke up to find myself at the hospital." British troops killed up to 16 Iraqi insurgents after their patrol was ambushed between the southern cities of Amarah and Basra on Friday, and two British soldiers were wounded, the Ministry of Defense said in London. However, Iraqi witnesses said 21 militiamen were killed and that they were loyalists of al-Sadr. The U.S. military said three soldiers died from wounds suffered in rebel attacks Friday, one died in a vehicle accident and one from "natural causes." As of Friday, May 14, 775 U.S. service members have died since the beginning of military operations in Iraq last year, according to the Department of Defense. Of those, 565 died as a result of hostile action and 210 died of non-hostile causes. It was unclear whether the latest deaths were included in the Department of Defense toll. On Saturday, a rocket landed in the compound housing the headquarters of the U.S.-led coalition in Baghdad, wounding one soldier and a civilian, both of whom later returned to duty, Kimmitt said. The slain militiamen in Baghdad's Sadr City included a police lieutenant who joined al-Sadr's al-Mahdi Army, witnesses said. U.S. jet fighters bombarded the outskirts of Sadr City overnight, forcing militiamen to flee positions, the witnesses said. On Saturday, U.S. soldiers drove through the neighborhood with loudspeakers, urging people to hand in their weapons within a week in exchange for money. In Najaf, gunmen from al-Sadr's militia controlled the city center. They had replaced a special force assigned to protect the Shrine of Imam Ali, one of Shia Islam's holiest sites. Bands of fighters stood at almost every street corner around the shrine, and some patrolled the area in a commandeered police pickup truck. On Friday, apparent gunfire slightly damaged a shrine, prompting calls for revenge and even suicide attacks. Twenty people signed up for an al-Sadr-backed suicide squad in the southern city of Basra on Saturday, though only 10 were accepted after undergoing checks by organizers. In Karbala, al-Sadr militiamen moved to new positions to the south, leaving the shrine district almost vacant except for small groups of Iranian and south Asian pilgrims. "I'm not scared," said Ahmed Ali, who sells Turkish lace from a shop in the shrine district. "In Iraq, we are addicted to war."